Oops! I’m a bit late on this one but I guess God had a purpose in it! I just got an email asking for prayer, so we’ll start with that! • Please pray for my sweet sister-in-law, Shelley, and her family. They just received word from the owner of the house they have been renting for the past 2 ½ years that he is selling the house and wants to begin showing it immediately. This is a big curve ball for the family, to say the least! Shelley just went back to work last week after the birth of their 3rd baby and they are already working through a lot of adjustments. Rent prices are currently very high in their area so relocating quickly to a place they can afford seems impossible at the moment! Please pray God would give them peace in the midst of the stress and lead them to the right home for their family. Pray for Shelley and her husband, Beau, to have wisdom and unity in their decisions as they put their trust in the Lord. • Deb has asked us to pray for her husband, Ray, as he is preparing to go on a missions trip to Malawi with a team from our church this spring. Please pray that God would provide for all the needed finances for the team and that the Lord would prepare Ray’s heart for the work that He has for him in Malawi. Pray also for Deb and her son as they prepare to be apart from Ray. 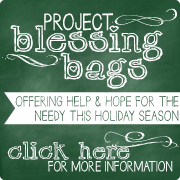 Pray that Bonnie will have the energy, resources, and Holy Spirit’s leading to put every bag in the right hands! • Finally, Throne of Grace could use your prayers as we’ve been experiencing great technical difficulties with our printing process. It is frustrating to be dependent on machines! Thankfully our God is bigger than technology! Pray that nothing would hinder the work He has for us and that we could keep up with the demand of orders. Please pray that we would trust the Lord and His leading to His solution! Enjoy the rest of your week, prayer warriors!